A few weeks ago, Jason, Sienna and I flew to Hawaii to celebrate our 5 year anniversary. We love Maui (it’s where we got engaged!) and wanted to go back with our daughter for our first family vacation. 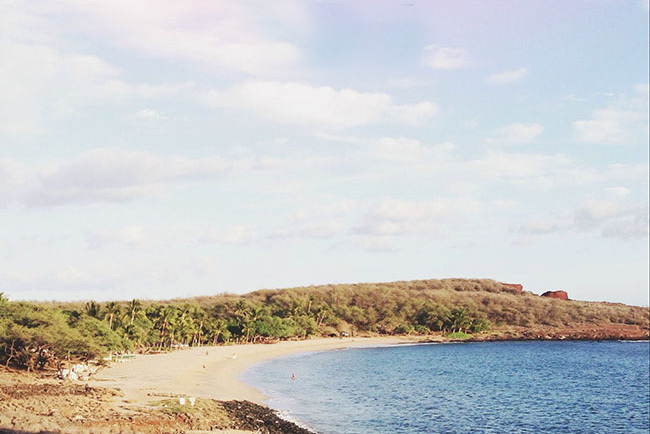 Maui is probably our favorite island and we’re always looking for new places to stay. 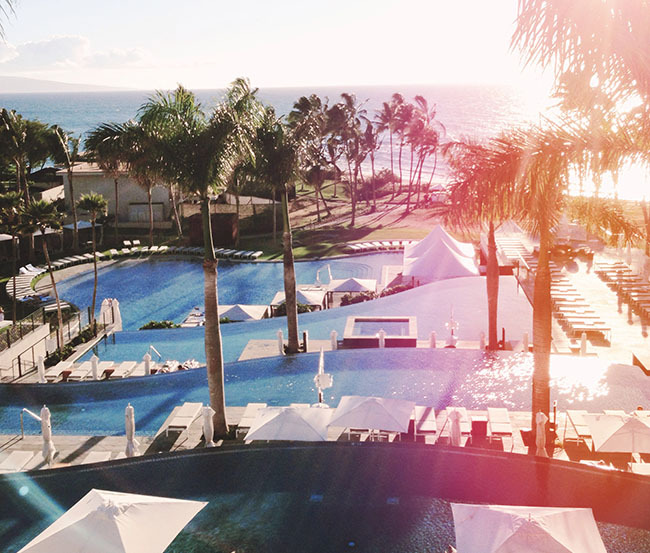 Our go-to travel gal Katie (of Everafter Honeymoons) suggested a brand new hotel, Andaz Maui at Wailea, that just opened in September and highly recommended that we go check it out. After a quick look at their site, I fell in love with their design + we booked our trip! As soon as we arrived at the Andaz Maui at Wailea, we entered one of my favorite hotel entrances (I mean check out that photo above!) and realized that the architecture, style and vibe of this property is completely different than any of the others at which we’ve stayed on Maui. 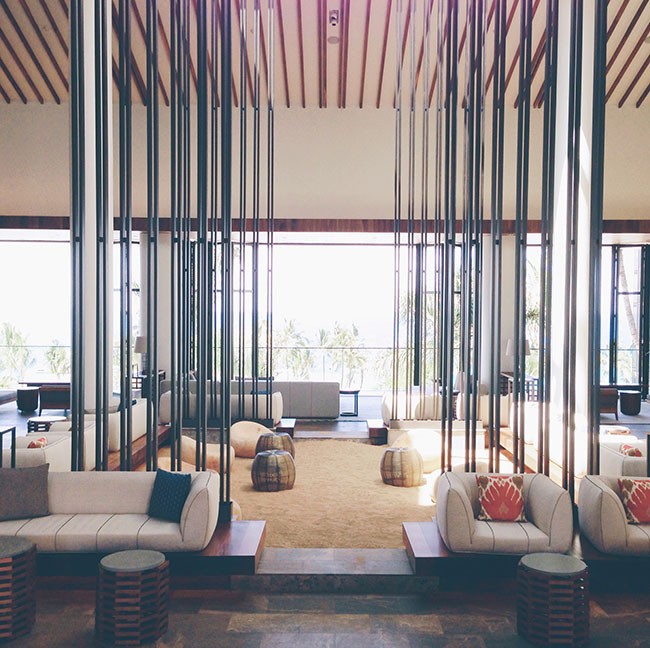 Walking into the lobby we were greeted by the friendly staff, breathtaking views of the Pacific Ocean and 3 infinity pools – as well as one the best designed lobbies I’ve seen! 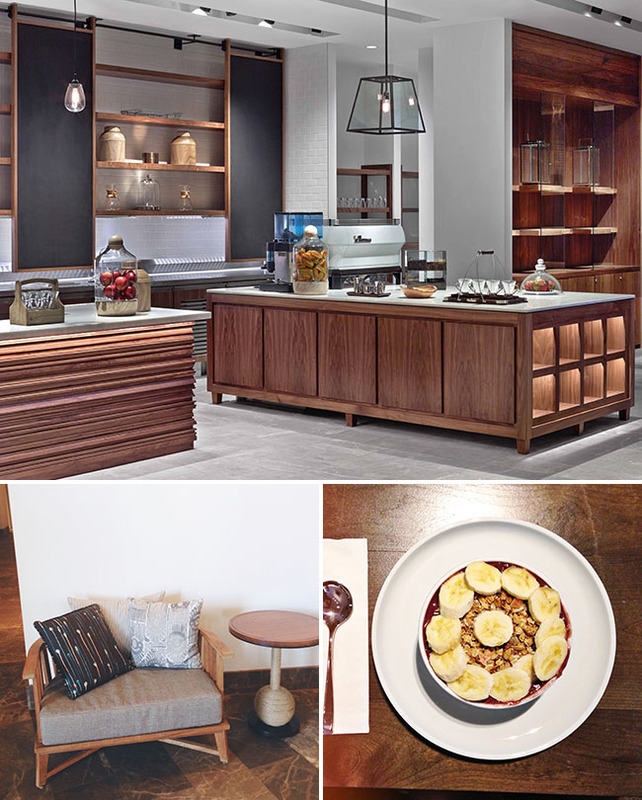 The staff works hard to ensure that each guest of the Andaz feels like they’re at home, or the very least like they’re guests at a good friend’s house, not a hotel….they really nailed it! Instead of waiting in a long line at a front desk to check in, the staff invited us to choose a couch with a view of our liking where we completed our entire check in. Gotta love that! Oh, and I almost forgot their leis….they smelled incredible….the entire time we had them on, we felt like we were sitting in a luxurious spa. 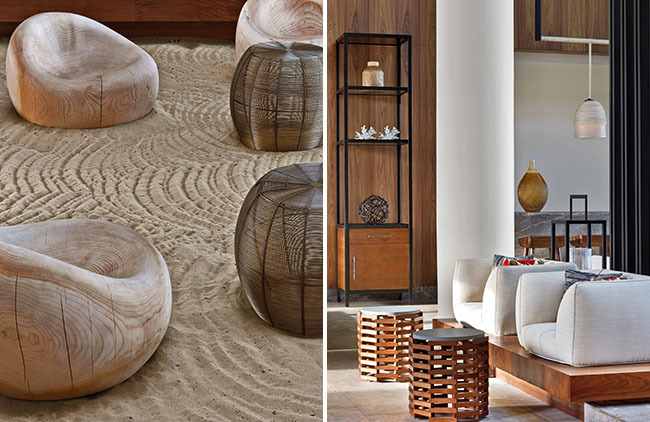 How fun that they incorporated sand into the design of the lobby?! The location in Wailea is one of my favorites. There is a nice walking path along the beach,so you can easily walk to other hotels, restaurants and shopping. However, Andaz is on the end of the path, so it doesn’t feel crowded like some other parts of Maui can get during peak seasons. As for activities, they have 3 infinity pools, as well as a lagoon, an adult pool and a beach. We spent most of this trip by the pool and beach. The poolside service was top notch and they had some seriously great poolside food + drinks. Our favorite lunch was the Steak Sandwich – but it wasn’t your typical sandwich. It was chunks of flank steak on plantains,instead of bread, with mangos + cilantro. Yum! Their chicken katsu was pretty delicious as well. And the drinks! 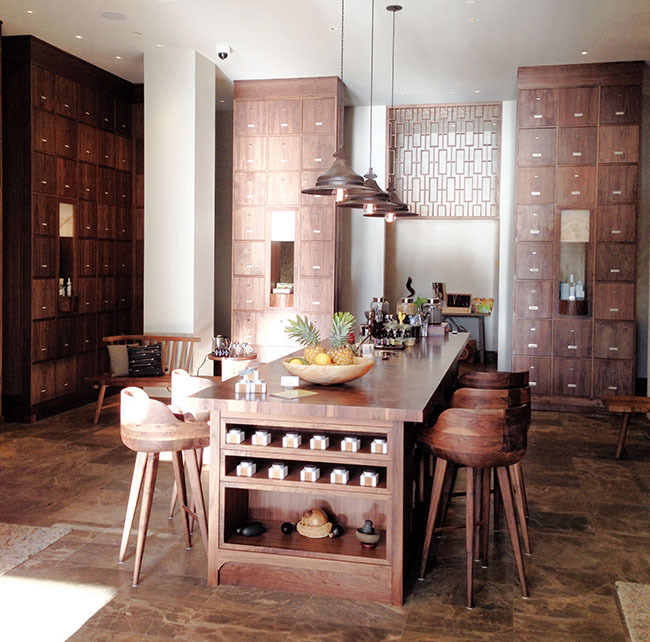 Love that all their drinks used fresh squeezed juices – you really can tell the difference. If you want to get active, you can paddle board, kayak or snorkel just steps from the pool. Each room has a balcony or patio. We had an amazing view of the ocean and it was nice to sit out there and get a little work done. One other thing I need to mention was the amazing service. This was the first time staying in a hotel with our (at the time) 6 month old daughter. When we got there we realized we weren’t going to be able to bath her in the sink (our original plan) since the sinks were super modern and only 2 inches deep. We asked the bellman if they happened to have any baby tubs to borrow. They didn’t, but they went out and bought one and it was waiting for us when we got back from dinner that first night. Little things like that really made our stay that much better. Oh, and free wifi as well as lots of outlets in the room was another big plus in my book! Let’s talk food. One of my favorite parts of traveling! :) And the food here didn’t disappoint. They have 2 main restaurants – Morimoto Maui (a sushi/seafood restaurant which will open next month from Iron Chef Masaharu Morimoto ) and Ka’ana Kitchen. We had dinner 3 of the 4 nights we were there at Ka’ana Kitchen. We just loved it! 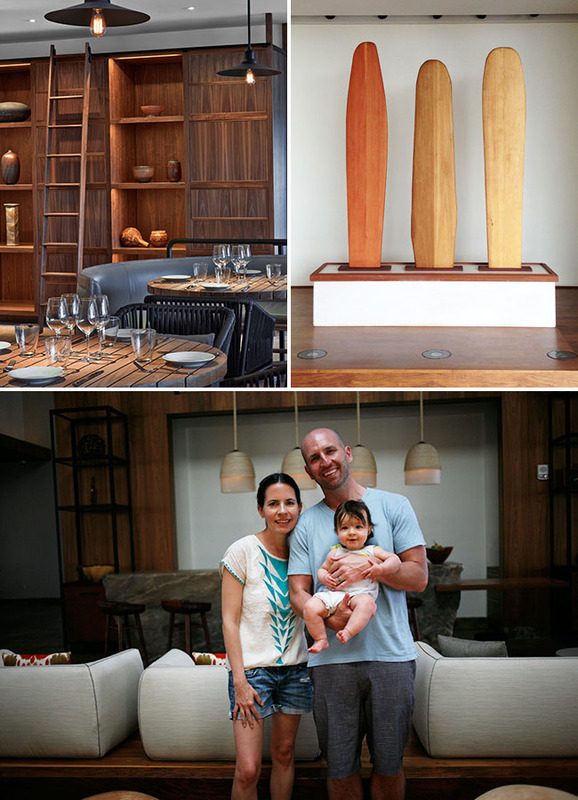 The restaurant is a farm-to-table concept and is all about local and in season ingredients. We even got to chat with Chef Isaac Bancaco, who is originally from Maui, our first night there. I just love his philosophy on food! He changes his menu each night with what he is able to get in season, fruit, veggies and proteins. In fact, Chef Isaac received a large batch of horseradishes the day we arrived and let us sneak a taste of his horseradish sorbet. Neither Jason nor I are huge horseradish fans, but that was some tasty sorbet….so refreshing but with a kick! 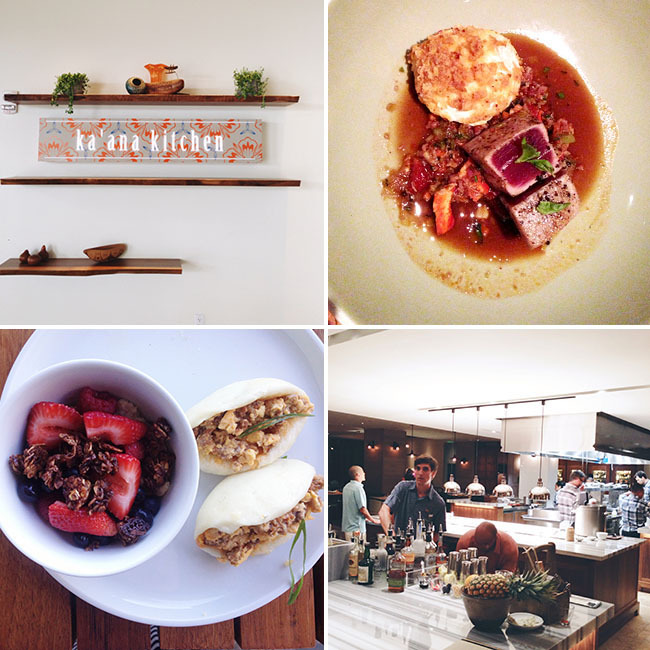 Some of our favorite dishes at Ka’ana Kitchen were with Ahi – the Ahi Bolognese (with burratta, lobster + tomato jam) and the Ahi #1 (with farro, marcona almonds + tomatoes). Breakfast. They had the most amazing breakfast buffet + such a great interactive layout! Staying on the trend of making you feel at home, the serving stations feel like just the areas people would hang out at a friends house for a party. It is a bit pricy (but most things in Maui are), but it’s now our favorite breakfast buffet ever. They had fresh made juices (the first morning I had apple, pineapple and mango with a kale shot – so on trend! ), local specials (bao with eggs + chorizo was a favorite ), omelet bar, fruit bar, steel cut oats, lots of baked goods, and so much more. So good. By the third day though, I really wanted a more simple breakfast, so we went to the Mokapu Market (also at the Andaz). This is a more grab and go place, but they serve yummy acai bowls, egg sandwiches, and coffee as well as pizza later in the day. The last 2 days there, we each got an acai bowl and then a coffee to go and walked along the beach – perfect way to start the day! This trip was all about relaxing, but if you are looking for other fun things to do in Maui, here are a few of our faves: watching the sunrise at Haleakala Crater (best to do on the first morning while you are still on your own time zone), taking a snorkeling trip to Molokini (I recommend the early morning trip before it gets too crowded), driving the Hana Highway (leave lots of time for hikes + swimming), and shopping in Lahaina. As for other restaurants, we also love Monkeypod and Ferraro’s (both in Wailea). Thinking about getting married in Maui? 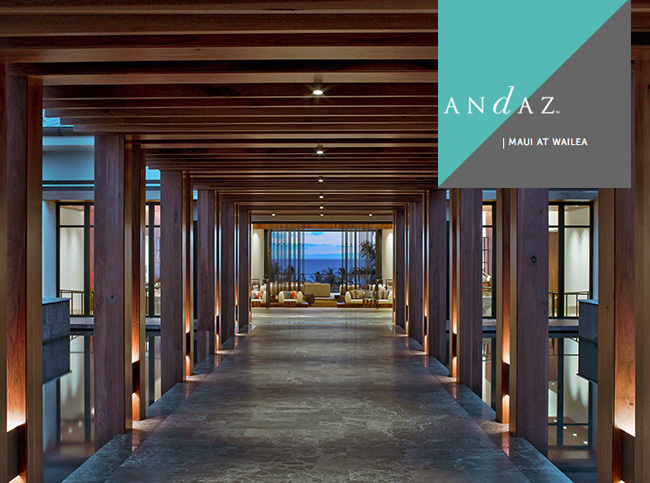 The Andaz would make a great wedding venue. They have some pretty stunning spots for a ceremony and reception. 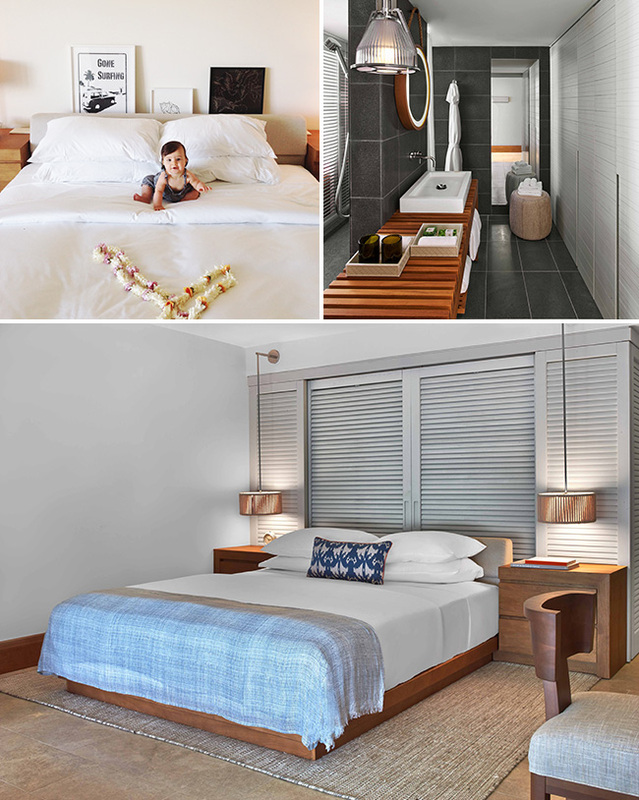 And if you book your wedding at the Andaz (with a minimum spend of $20,000), mention you found them on GWS and you’ll receive a complimentary upgrade from a published room rate to an Andaz suite (maximum 4 night stay). Ah Wailea was absolutely beautiful. My husband and I did a photoshoot near here as it was recommended to us by a local Hawaiian photographer. 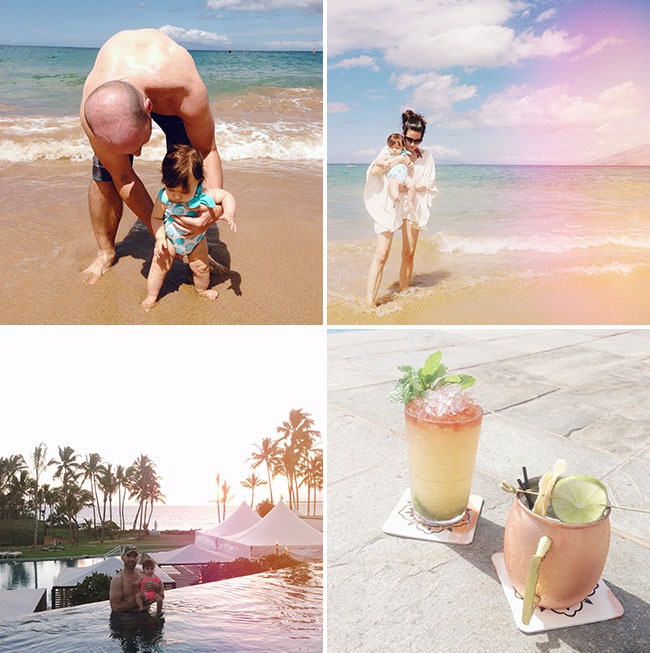 Loved your pictures and wish I had more time to stay in Wailea.